Provide IV fluid therapy only for patients whose needs cannot be met by oral or enteral routes, and stop as soon as possible. Skilled and competent healthcare professionals should prescribe and administer IV fluids, and assess and monitor patients receiving IV fluids. Passive leg raising is a bedside method to assess fluid responsiveness in a patient. It is best undertaken with the patient initially semi-recumbent and then tilting the entire bed through 45°. Alternatively, it can be done by lying the patient flat and passively raising their legs to greater than 45°. If, at 30–90 seconds, the patient shows signs of haemodynamic improvement, it indicates that volume replacement may be required. If the condition of the patient deteriorates, in particular, breathlessness, it indicates that the patient may be fluid overloaded. If patients are receiving IV fluids for resuscitation, reassess the patient using the ABCDE approach (Airway, Breathing, Circulation, Disability, Exposure), monitor their respiratory rate, pulse, blood pressure and perfusion continuously, and measure their venous lactate levels and/or arterial pH and base excess according to guidance on advanced life support. · Patients receiving IV fluid therapy to address replacement or redistribution problems may need more frequent monitoring. 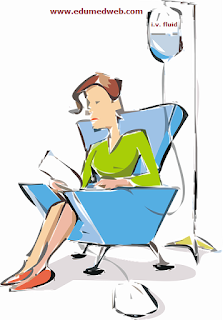 · Patients on longer-term IV fluid therapy whose condition is stable may be monitored less frequently, although decisions to reduce monitoring frequency should be detailed in their IV fluid management plan. If patients have received IV fluids containing chloride concentrations greater than 120 mmol/l (for example, sodium chloride 0.9%), monitor their serum chloride concentration daily. If patients develop hyperchloraemia or acidaemia, reassess their IV fluid prescription and assess their acid–base status. Consider less frequent monitoring for patients who are stable. If patients need IV fluid resuscitation, use crystalloids that contain sodium in the range 130–154 mmol/l, with a bolus of 500 ml over less than 15 minutes. Do not use tetra starch for fluid resuscitation. Consider human albumin solution 4% to 5% for fluid resuscitation only in patients with severe sepsis. · Approximately 50–100 g/day of glucose to limit starvation ketosis. For patients who are obese, adjust the IV fluid prescription to their ideal body weight. Use lower range volumes per kg (patients rarely need more than a total of 3 litres of fluid per day) and seek expert help if their BMI is more than 40 kg/m2. When prescribing for routine maintenance alone, consider using 25–30 ml/kg/ day sodium chloride 0.18% in 4% glucose with 27 mmol/l potassium on day 1 (there are other regimens to achieve this). Prescribing more than 2.5 litres per day increases the risk of hyponatraemia. These are initial prescriptions and further prescriptions should be guided by monitoring. Consider delivering IV fluids for routine maintenance during daytime hours to promote sleep and wellbeing. Adjust the IV prescription (add to or subtract from maintenance needs) to account for existing fluid and/or electrolyte deficits or excesses, ongoing losses or abnormal distribution.